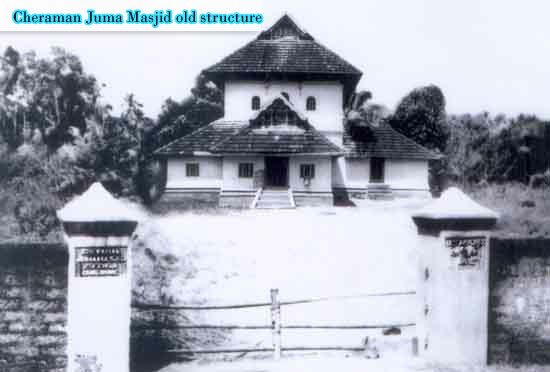 Cheraman Juma Masjid, built in 629 CE at Methala, Kodungallur Taluk, Thrissur District in the Indian state of Kerala is the first mosque in India and third outside Saudi Arabia. It was built by an arab named Malik Deenar, who was a follower and contemporary of Islamic Prophet Muhammad and arrived in India to propagate Islam. Even before Islam was established in Arabia, there were trade relations between them and India for thousands of years. Jirrham Bintoi who lived 165 years before the prophet Muhammed, wrote poems in Arabic about Emperor Vikramaditya and his golden reign. Arab is distorted term of Arav (Horse in Sanskrit) and Aravasthan was from where good quality horses were imported to India by Kings. Later, Aravasthan became Arabasthan and Arab/Arabia. Kozhikode (Calicut) was the biggest port city during those times and Arabian ships were made of Malabar teak. The trade of malabar wood with Kerala was biggest until oil boom came up in arab countries during past 100 years and changed their mindsets. 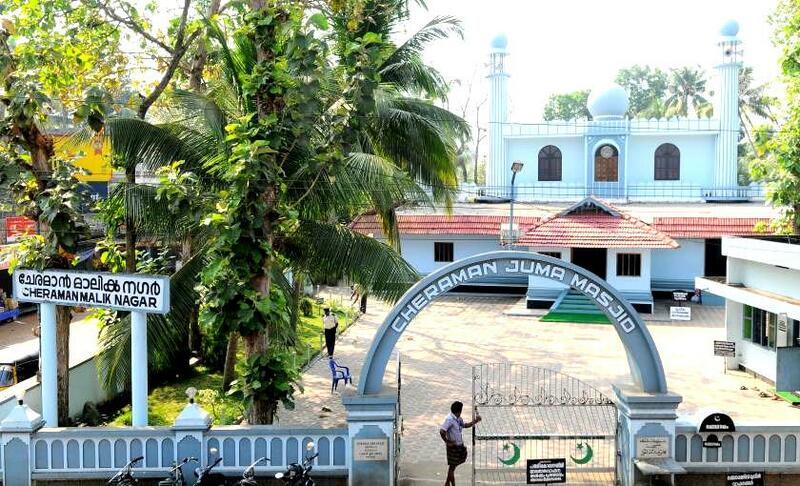 Cheraman Perumal, the Chera king during those times, donated land to Malik Ibn Dinar and his followers to construct a Masjid in Kerala and it was named after the King. When Cheraman came to know that Propher Muhammad has installed the black stone of the Siva lingam , on the South East corner of the Kaaba, he was disturbed and left to Mecca to intervene. His ship sailed from Calicut to Salalah, then he went by land to Mecca and met Muhammad. Cheraman Perumal gave some tangy Calicut ginger pickle to Muhammed who ate it with great relish. The Prophet distributed it among his companions too. On the way back to Calicut, King Cheraman fell sick and died. He was buried at Salalah, Oman. 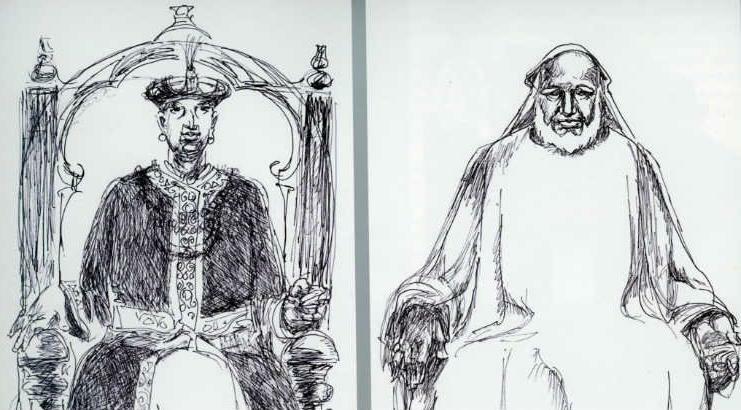 Muhammad’s followers propagated that King Cheraman Perumal was impressed by Islamic religion and was converted by Mohammed to bear the Muslim name Tajuddin given to him by Hazrat Syedina Muhammadur Rasool. None of the King’s messages that reached Kerala through Hawks, ever had this story. However, the dead king cannot reveal what happened and Malik Ibn Dinar came to Kerala (after Prophet’s death in 632 CE), met king’s relatives with letters claiming that Cheraman asked them to allow him continue spreading Islam. Few at Salalah, where the tomb of Cheraman Perumal is refered to as the Tomb of Tajuddin, say that Malik Ibn Dinar was arm-twisted to write such letters and later died of remorse in 648 CE, 5 years after coming back to Kerala. This mosque has an ancient oil lamp which always burns and which is believed to be more than a thousand years old. People of all religions bring oil for the lamp as offering. Like most, this mosque allows entry for Non-Muslims. Couple of Mosques were built in Arabia during 622 CE and two more were built outside Saudi before Cheraman Mosque. One was Huaisheng Mosque in China built during 627 CE and other was Masjid al Qiblatayn in Somalia, also built in 627 CE. An year later, Palaiya Jumma Mosque was built in Tamil Nadu is typical dravidian temple architecture. One can notice the pillars carved out of stone in same was as in hindu temples. Ibn Battuta, a 14th century traveller from Morocco, visited both these Mosques and mentioned about them in his writings.